What Is Sepsis and How Can BrightStar Care Help Central Western Riverside County Seniors? | BrightStar Care " "
What Is Sepsis and How Can BrightStar Care Help Central Western Riverside County Seniors? Sepsis (Septicemia) is one of the most common reasons individuals are readmitted to the hospital after a procedure or treatment for another condition, but many people do not know what it is. In addition to health concerns, this can also cause unnecessary emotional stress and financial burden. If your Central Western Riverside County senior loved one recently visited the hospital, these answers to common questions may help you reduce the likelihood of a return trip to the hospital as a result of this serious condition. Sepsis is the body’s overwhelming and life-threatening response to infection that can lead to tissue damage, organ failure, and death.1 Sometimes, sepsis can occur as a result of contaminated blood sources during a procedure, but more commonly it happens as a result of another less-serious infection. For example, for someone whose immune system is compromised, a simple urinary tract infection (UTI) left untreated can spread to the individual’s blood and cause sepsis. Who is Most Likely to Get Sepsis? Sepsis is triggered by an infection, which can affect people of all ages. However, some people are more likely to develop sepsis than others. 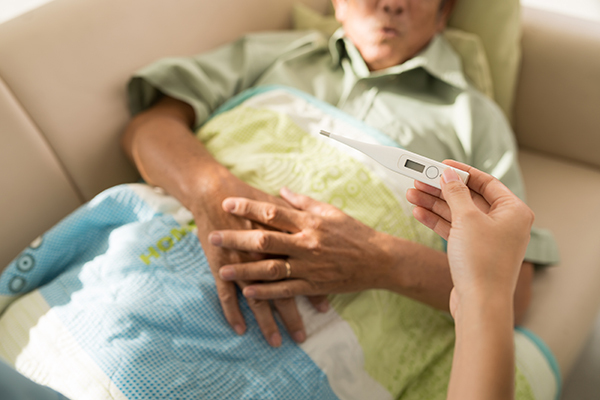 The Central Western Riverside County elderly and those who are extremely frail are most susceptible as their bodies are weaker and less able to fight infections that may lead to sepsis. Individuals who have multiple illnesses, people with autoimmune disorders or those undergoing chemotherapy or other drug regimens are also considered high-risk because of their weakened immune systems. Other conditions that may be more likely to develop sepsis include diabetes, heart failure, and pneumonia. It is important to note that these symptoms also may indicate general changes in condition that may be unrelated to sepsis. Given that sepsis is often a life-threatening condition, it is treated with an aggressive IV drug therapy including antibiotics and fluids. This is most commonly administered at the hospital, but the infusions also can be performed at home depending on the severity of the case. How Can I Help Prevent Someone From Getting Sepsis? If your loved one was recently discharged from the hospital or currently has an infection of some kind, the most important thing you can do is pay attention to all changes in condition. Do not brush off any new or changing symptoms. A change of condition does not always indicate sepsis, but it could signify another condition that requires medical attention, so it is important to be alert. How Can BrightStar Care Help? Many families find they could use some additional support in caring for a Central Western Riverside County senior loved one who has recently been discharged from the hospital or has chronic health conditions. This can be especially helpful if the individual is at high risk of developing sepsis. BrightStar Care is uniquely positioned to help provide a safe and healthy transition home from the hospital. A Registered Nurse oversees each client’s plan of care, which leads to better surveillance and an increased likelihood of catching sepsis early. Each member of our in-home care teams is also trained to observe and recognize changes in condition and to alert the nurse accordingly. Additionally, our professional caregivers follow national standards for infection control and understand the importance of hand washing and being careful not to introduce bacteria to sensitive areas. Our nurses also can help families understand what to look for and when medical intervention may be necessary. San Jacinto, Corona, Murietta and Temecula.